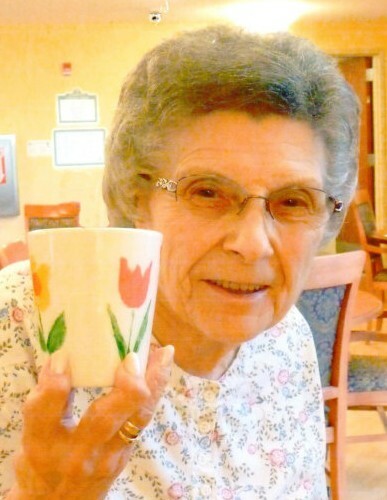 Dolores M. Markus, nee Kapp, 89, of Waterloo, IL, died March 26, 2019, in Waterloo, IL. She was born July 2, 1929, in Carlyle, IL. She is survived by her children Darlene (Bob) Niebruegge and Michael (Dawn) Markus; grandchildren Dan (Lauren) Niebruegge, Bill (Stacey) Niebruegge, Kacie (Adam) Maxwell, Matt (Lindsay) Markus, and Lance (Christine) Markus; and 14 great grandchildren; sister-in-law Mildred Kapp; nieces; nephews; and cousins. Dolores is preceded in death by her husband Camillus J. "Cam" Markus; daughter Linda K. Luhr; grandson Jason A. Luhr; brothers Howard (Catherine) Kapp and Wilford Kapp; sister Helen (George) Wuebbles; in-laws Gregory (Mary) Markus, Rosina Markus, Hubert (Rose) Markus, Marcella (Paul) Richter, Alfred (Rita) Markus, and Cyril (Edna) Markus. She is a member of SS Peter & Paul Church-Waterloo and Mary and Martha Society.